A rare and hard to find, large teak bowl by J.Quistgaard. Unusual form with raised handles and great patina. 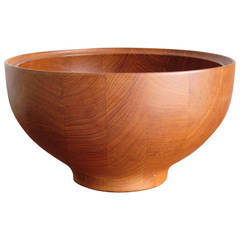 A classic teak wood bowl designed by Jens Quistgaard, Danish, (April 23, 1919 – January 4, 2008). An unusual brass bowl by Carl Auböck. Unusual curves and shape add to the charm of this piece. Beautiful patina. An unusual, vintage, circa 1950s carved mahogany bowl and tray. Large scale approximate 29.5" long and beautifully crafted. Probably designed by Arthur Umanoff and made in Haiti. A Jens Quistgaard designed oval vessel constructed of staved teak, for Dansk. A very nice Danish modern staved teak bowl by Jens Quistgaard for Dansk, circa 1970s. The bowl is 11.5" in diameter and 4.5" high and in very good condition. 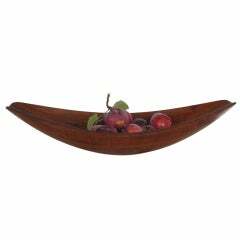 A large teak canoe bowl designed by Jens Quistgaard, for Dansk, circa 1950s. Staved teak Danish modern ice bucket designed by Jens Quistgaard for Dansk, circa 1970s. The piece is 9.25" in diameter and 6.25" high with black plastic liner and removable lid.